MT Sunflo is a responsive storefront theme that can be viewed from tablets and smartphones as well as normal desktop viewing resolutions. The theme can be used for a variety of storefronts and supports easy design customization from a separate theme options panel located in the main admin panel. It also supports Google fonts and comes with multiple menu options. The theme comes with unlimited color options in an style picker that allows users to change all the color combinations right from the browser. It includes a featured content space below the header, along with a full-width image slider for your latest products, deals, discounts and images. A tabbed content extension allows you showcase featured products from multiple categories within the same content space. The theme also comes with a newsletter opt-in facility where users can submit their email address and subscribe to your lists. It also includes embedded social media links and a contact form using which users can directly send a message. A primary Megamenu where you can add multiple columns of internal links along with banners, images and video clips within the menu. A separate top menu has quicklinks for account management and shopping cart options. You can also add quicklinks for your internal pages in the footer. Users can also do a keyword search using the search box in the header along with an advanced search option with multiple custom attributes helps users easily locate specific products. A separate shopping cart icon shows the current cart contents and associated cost. Within internal pages, you can also include category quicklinks and an additional smartmenu in the sidebar. Internal product pages come with an image scroller for multiple images and a Cloud Zoom feature which displays a magnified version of the part of the image selected by the on-screen mouse icon. Also included is a tabbed content extension for your product details and a “Related Products” slider. Within internal category and search result pages, users can choose the number of listings per page, the display layout, and can also sort by available attributes. Registered users can post reviews, add products to wishlist, compare products and submit product tags. The theme is cross browser compatible and comes with included PSD files for easy customization. 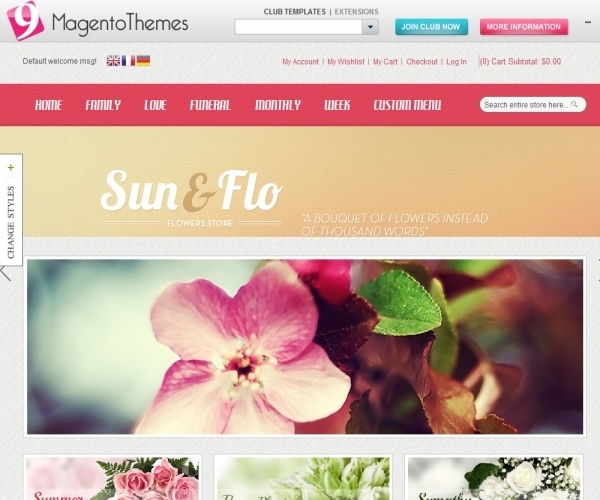 The MT Sunflo theme is priced at $100.